Festive family fun is what Ottawa’s Winterlude is all about! During this annual event you can skate on the world’s largest skating rink,  the Rideau Canal, check out the ice sculpture competitions at Crystal Garden (Confederation Park) or play at Snowflake Kingdom, North America’s largest snow playground! There are fun activities for the entire family. 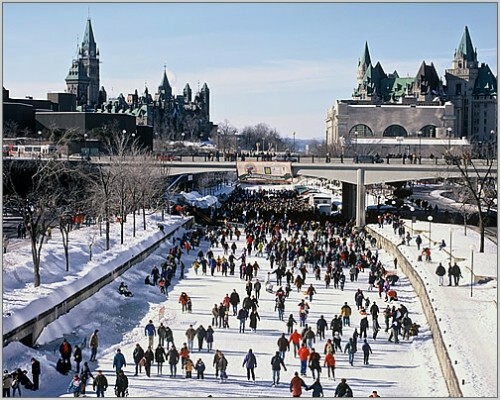 Winterlude takes place along the World’s largest skating rink, the Rideau Canal Skateway, and sites across the capital. Close to 600,000 people take part in Winterlude activities – most of which are free – each year. Fantastic ice carvings by artists from around the world fill Confederation Park in downtown Ottawa. The world’s biggest snow playground – the Snowflake Kingdom – welcomes kids of all ages to Jacques Cartier Park in downtown Gatineau. The Winterlude mascots – the Ice Hogs family – are reputed to live under the ice of the frozen Rideau Canal Skateway. Winterlude has been celebrated in Ottawa and Gatineau for over three decades. World Discovery offers tailor made holidays to Canada, including Ottawa. Well, the site at which the Camp stands has long been known as a sleeping place for elephants. And Just to prove the point one of the resident elephants Samburu (Sam in short) who had not been seen for about a week and a half turned up at the camp yesterday at 5 in the morning. He seemed to be quite tired, as if he’d been on the move for a long distance. Without hesitation he headed to the back of tent 5, lay down and went to sleep. However the sun was a little hot for him as there is no shade in this area. 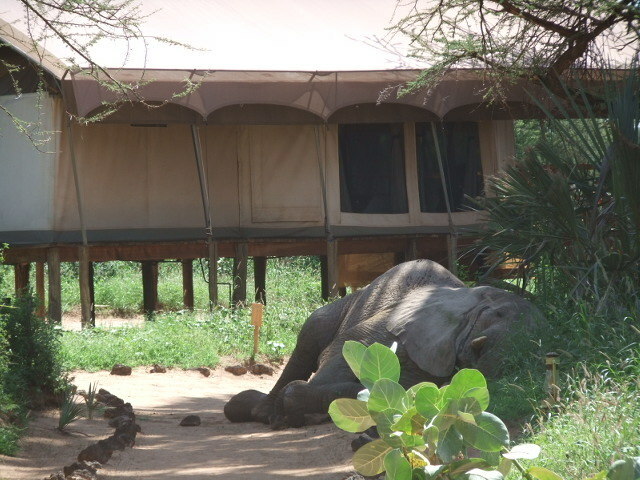 He got up and moved to a shaded area behind tent 6 lay down and in a few minutes he was snoring fast asleep, much to the disbelief and amusement of guests and staff. After a one hour ‘power nap’, he got up and started wandering around the camp as usual, obviously refreshed. The camp’s head Driver/Guide Julius points out that Elephants don’t sleep often due to their need to feed for long hours to attain the average food requirement of 200-250 kilos a day. He further observes that they normally sleep standing or leaning on trees during the day, for short naps. At night they lie down to sleep properly for between 2 to 3 hours, depending on how secure they feel in a given area. A number of bulls that are resident within the Elephant Bedroom Camp area often sleep lying down between the tents at night. This shows how safe they feel in the camp. 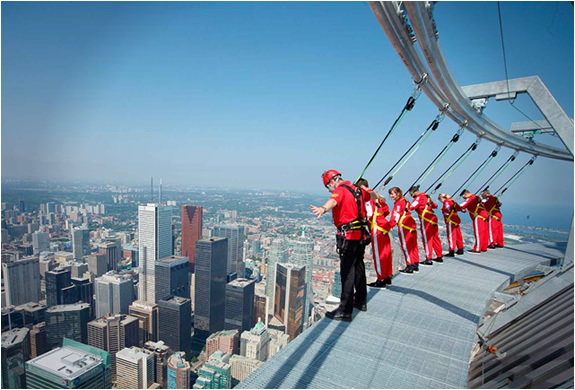 EdgeWalk is CN Tower’s most thrilling attraction in its history, and the first of its kind in North America. It is the world’s highest full circle hands-free walk on a 5 ft (1.5 m) wide ledge encircling the top of the Towers main pod, 356m/1168ft (116 storeys) above the ground. Visitors walk in groups of six, while attached to an overhead safety rail via a trolley and harness system. Trained EdgeWalk guides will encourage participants to push their personal limits, allowing them to lean back over Toronto with nothing but air and breathtaking views of Lake Ontario beneath them. Designed with the highest international safety and security standards in mind, EdgeWalk runs for 1.5 hours, with the outdoor walk lasting approximately 30 minutes. Participants also receive a Tower Experience Ticket which includes access to LookOut, Glass Floor, SkyPod, Movie and Motion Theatre Ride. Click on World Discovery’s Canada Holidays for a range of set departures and tailor made options throughout Canada. 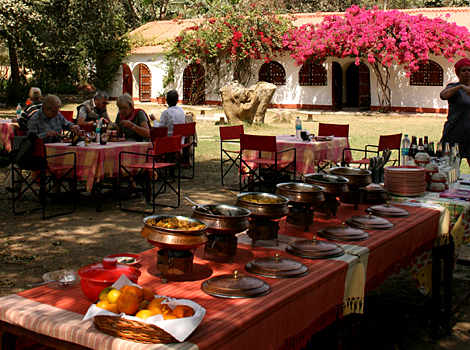 Congratulations to Chambal Safari Lodge! Chambal Safari Lodge and their team have won the Silver Award – Best for Wildlife Conservation at the World Responsible Tourism Awards 2014. We would like to take this opportunity to congratulate them on their fantastic achievement. This small, family-run, lodge offers a superb wildlife experience away from the more popular tourist routes, yet is easily reachable in a couple of hours by road from the world-famous Taj Mahal at Agra. The lodge has just 12 comfortable rooms. Its sprawling grounds are home to numerous birds and small mammals. Evening Nature Walks around the lodge, with the resident Naturalist, are the best time to go looking for Palm Civet Cats, Jungle Cats, Foxes, Jungle Hares, Fruit Bats, Hedgehogs and the Indian Striped Hyenas. With a checklist of over 180 birds, birding in the lodge grounds starts with the ‘wake-up call’ of the barbets and babblers, and continues through the day with the birdsong of hornbills, koels and tree-pies, and well into the evening with the foraging fruits bats and hooting owls. With a rich heritage stretching back many millennia the Chambal Valley has much to offer from its stunning landscapes and magnificent wildlife, formidable fortresses and crumbling ruins, tranquil temples and flamboyant fairs, colourful history and compelling mythology, a proud resilient people and their legendary exploits. Accompanied by experienced local guides and naturalists, guests may explore the Chambal Valley at their own pace – on boats, jeeps, horses, bicycles or on foot. On the river safari you should see a variety of wildlife including gharials, marsh crocodiles, Gangetic river dolphins and over 300 species of birds. You can take a camel safari through the ravines to the magnificent ruins of Fort Ater, or travel by jeep in search of blackbuck and Sarus cranes. Visit the medieval temple complex of Bateshwar with over a 100 temples lined along the Yamuna River, enjoy a nature walk with trained naturalists, or visit local villages with your guide, exploring an authentic rural landscape. Take a look at World Discovery’s Into the Chambal Valley for further information and a suggested itinerary.